While teaching myself to fly fish, I found myself using methods that were far from what I saw other people on the river doing. I didn’t care much about how I looked fishing, though; I was just trying to catch fish. But, when I began to discuss what I was doing with other fly fishermen, I found that not only had I not invented these tactics myself, but that some of them had been used for as long as fly fishing has existed. One of those methods is known as Dapping. What is Dapping in Fly Fishing? Dapping is a fly fishing technique that allows only the fly to touch the water- no leader, no tippet, no fly line, just the fly. It uses a small amount of line, and there is no casting. Dapping is considered to be one of the oldest forms of fly fishing. The Compleat Angler, written in 1653, describes the technique, saying “Let no part of your line touch the water, but your fly only.” Izaak Walton’s been dead for a few hundred years, so you know dapping has been around for a long time. But why, in the modern age of advanced fly fishing technology and techniques do fishermen revert back to such a primitive method? Because it works. 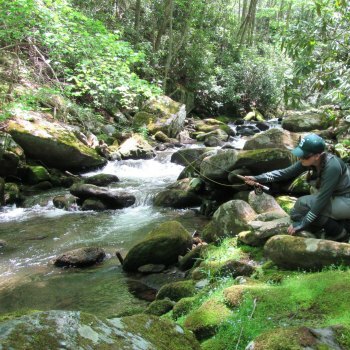 Dapping is an effective method for catching trout in certain situations because it presents your fly more realistically than a traditional cast-and-drift tactic could. 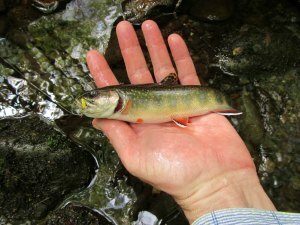 If you spend some time observing trout feeding on living insects off the surface(which I highly recommend you do if you’re trying to understand these fish), you will notice that they aren’t always just eating the flies that are sitting dead still on the water. Often times, the trout are keying in on the flies that are falling on the surface of the water, jumping off, landing again. They’re attacking the active flies, the flies that are clearly real meals. Dapping flies imitates these insects. The fly is not dead drifting, but being bounced around the surface of the water, giving it the appearance of life, and enticing the trout to feed. Dapping is also a more targeted approach to fly fishing, which comes with a distinct advantage that some anglers prioritize. Because you’re using such a short amount of line, you control exactly what fish is below your fly. There are few, if any, by catches while dapping. One legend in the dapping world (bet you didn’t know that existed) is a man by the name of Donald Miller, but the brown trout know him as Dapping Don. Don is the author of “Dapping. A Fly Fishing Technique: My Secret Method of Catching Large Dominant Trout.” In this book, he describes how the only fishing method he uses anymore is dapping, and he only uses it to target large, dominant, educated brown trout. His explanation is simple: the biggest brown trout in the rivers have been there the longest time. They’ve seen all of our flies, heard what fishermen sound like, and have likely been caught several times. Through all of this, they’ve learned and become much harder to catch. Dapping is a targeted and stealthy approach that entices these smart fish to make a mistake. To dapp for these trophy fish, Don relies on spot-and-stalk tactics, camouflaged clothing, a complex system of eyewear, and a 13-20 (20!!) foot rod. But the most common motivation for dapping, in the United Sates, is that it can be used in situations where other methods are impossible- waters that are covered in thick cover, making back casts impossible, or that are surrounded by boulders, disallowing your drifts. In these situations, you either dapp or you walk past the fishing hole. So now that you know what dapping is and why it is done, how do you do it? It is incredibly simple. Approach your fishing spot stealthily. Dapping requires you to be a rod length away from the fish, a fact that if realized by said fish, will send it into complete and utter panic. It is best to stay low to the ground to minimize your silhouette and to avoid splashing through the water. Stay out of the water completely, if you can. Once near the fishing spot, make sure your fly line is reeled in completely. You only want a small section of your leader and tippet to be out of your rod. In most situations, 4 or 5 feet of line will do. Then, slowly extend your rod so that your fly is dangling over the spot that is holding fish. Try to keep an eye on the fish and see if they react to the fly coming in. Next, lower the fly so that it is barely making contact with the surface of the water. If the wind is slightly blowing, it will dance the fly around; if not, add subtle action to the fly by slightly wiggling the rod. If you’re fishing true pocket water, continue to dangle the fly until you get a bite, or have scared the fish off. But if you can manage a small drift, follow the flow of the water with your rod tip while dapping the fly across the surface of the water. If you get a bite and miss, simply continue the drift and try again. Where is the best place to Dapp a fly? The easiest places to effectively dapp a fly is in small pocket water where there are over hanging branches or bushes, and fish that don’t get too much fishing pressure. The shrubbery will somewhat mask the appearance of your fly rod as it looms over the water. And fish that don’t get much pressure will be less fly shy. But, the legendary Dapping Don advocates dapping in almost any situation, provided you can get close enough without scaring the fish. Setting the hook while dapping is similar to setting the hook while fishing with dry flies in the conventional manner; in this case, it is just exaggerated. While dry fly fishing, it is imperative that you don’t set the hook the moment the fish swirls on your fly. If you do so, you’ll rip the fly out of the fish’s mouth before he closes it. Instead, you must pause for a moment to allow the fish to take the fly and close its mouth, then you briskly raise your rod to set the hook. When dapping a fly you simply wait a moment longer before setting the hook. Dapping does provide an advantage in hook setting, though, as since you maintain a tight, short amount of line, the hook sets can be extremely quick and effective (as long as the timing is right). As with all things, it just takes practice to learn your lesson (and missing hundreds of fish). What are the best flies for Dapping? Dapping can be done with any dry fly, or even an un-weighted wet fly. Just pay attention to what is buzzing around the water and match the hatch. One thing to consider, though, is using flies that maximize buoyancy. Focus on foam flies and parachutes, and be sure to use proper amounts of flotant. What are the best fly rods for Dapping? The fly rod you’re using now can probably be used for dapping, though it may not be the most effective tool. In small, pocket water, short length 1-3 weight rods will be the easiest. Because you’ll be navigating in and around trees and bushes, the length will save you from frustrating tangles and potential rod breaks. And since the fish in this water aren’t big, you’ll have plenty of rod for the short fights. But, in bigger, more open water, you can get more aggressive. As mentioned earlier, Dapping Don uses the longest rods that he can manage. These are custom made pieces that allow him to be as far away as possible while still being able to dapp. But, if you’re not looking to commission a rod to be built, you can instead purchase a 2 or 3 weight spey rod of 12 or 13 feet in length. These will get you close to the Dapping Don length, but won’t be nearly as much trouble or expense. We’ve got to GROW this sport which means taking a KID Fly Fishing. Read how to in this article. How to Teach Kids to Fly Fish.